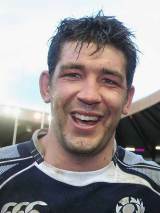 Scotland lock Nathan Hines was born in Wagga Wagga, New South Wales and played rugby league in his youth before travelling to Galashiels for a stint with Gala RFC in 1998. After his spell with Gala Hines joined Edinburgh, and made his Scotland debut against New Zealand in Auckland in 2000. Hines would have to wait two years for his next cap however, as two serious injuries ruled him out until Scotland's Test with Canada in June 2002. Hines won an unwanted distinction in his next Test as he became the first Scot to be sent-off when he was given his marching orders against the USA. In 2005 Hines announced his retirement from international rugby after becoming disillusioned with the Scotland coaching setup under Matt Williams. He also swapped Edinburgh for French Top 14 side Perpignan in the off season. Hines reappeared on the international stage when Frank Hadden, his former coach at Edinburgh, was appointed as Head Coach in 2006. Since then he has gone on to become an important part of the Scottish pack, and alongside Jim Hamilton he has galvanised their forward effort. In 2007 he made his second World Cup squad before helping Scotland to greatly improved performances against South Africa and Canada in the 2008 autumn internationals. He was selected for the 2009 Lions tour of South Africa and was tipped to play in the second Test to beef up the Lions' pack after a weak showing in the first Test. The Lions' plans were hampered however when Hines was cited after a match against the Emerging Springboks for a dangerous tackle on second-row Wilhelm Steenkamp. Hines was banned for one-week and missed the second Test and did not feature in the third. Following his return from South Africa Hines signed a two-year deal with Heineken Cup champions Leinster. He retained his place within the Scotland set-up during his stay with the province but was alternated between lock and flanker at international level. In 2011, he signed a two-year deal with French giants Clermont that will see him return to the Top 14 following the Rugby World Cup. Hines appeared in all four of Scotland's games during the World Cup, with three of the four appearances coming from the bench. And after a group stage exit from the tournament, Hines announced his international retirement on November 9 citing family reasons behind his decision.